Welcome to a presentation and an exhibition in S12 Studio and Gallery. A retrospective is introducing the artists that have taken part in the AiR in S12 program from 2010 till now. It is to mark the moving of S12 this autumn to a new location in Bontelabo 2 making the retrospective the last exhibition we show in our Gallery in Skostredet. We will during a period of 9 weeks, introduce all the artists who have taken part in our AiR in S12 program. Every week we will send out a newsletter introducing participating artists, year by year with information on our www page, Facebook, Instagram, Twitter and slowly an exhibition will come to life in our Gallery. The AiR in S12 program was launched in 2010 and has since hosted 48 international artists who work both within and outside the glass field. Its goal is to support international artists who use experimental, conceptual, and innovative approach when working with glass. One to two artists can be hosted at a time, and they are provided with housing, unlimited access to the workshop, assistance, and in many cases the possibility to display their works or arrange an exhibition at the end of their stay. S12’s unique situation, as a combination of an open access workshop that maintains and runs an adjacent gallery and a project room, allows artists, during the development of their work to think about how to best present the work when finished. Located on a street level in the center of town, it has also been possible for the public to meet the artists and to follow the process from experimenting with the material to making and then presenting a completed work. We welcome you on this journey with us and hope you will enjoy meeting the 48 artists, seeing their works both in the making and when ready in an exhibition. Welcome to S12´s last Artist talk hosted in Skostredet 12. At this event we will present two outstanding artists who work with glass in a way rarely to be seen in Norway. Æsa Björk and Anne Petters both challenge the boundaries of glass as a material in combination with other media such as video, sound and light. 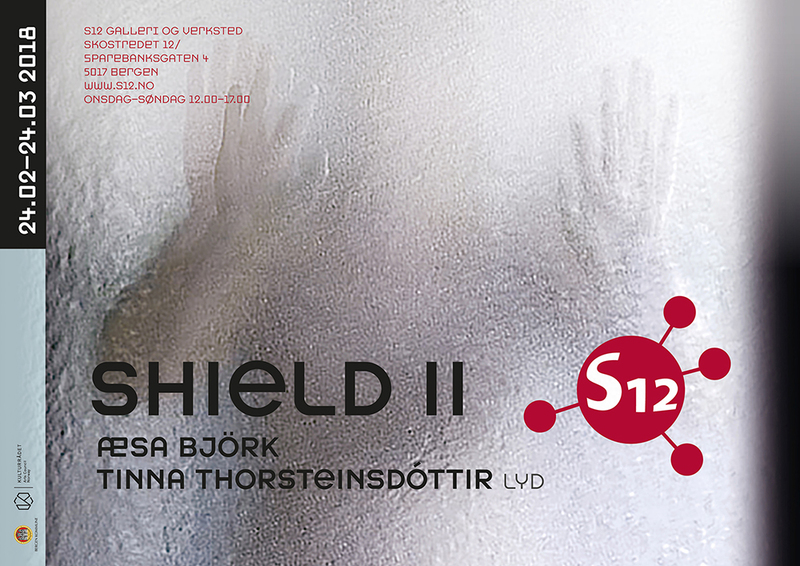 Æsa Björk’s exhibition “Shield II” can be seen in S12’s gallery where Anne Petters also will present some results from her period as Artist in Residence in S12. The presentations will be held on Saturday, April 14th. 2:00 p.m. The event is free, coffee and tea will be served. Æsa Björk (Iceland) graduated from Edinburgh College of Art, with a BA (Hons) in 1995 and MDes in 1997. Early on in her career she focused on glass as a sculptural material which led her to the Academy of Arts, Architecture and Design in Prague – Umprum as an exchange student in the studio of Vladimir Kopecky. The stay in Prague had a strong influence on her work, which continues to explore the conceptual and sculptural possibilities of glass, often in combination with other media and materials. She has been an Artist in Residence at the Pilchuck Glass School (EAiR), the Corning Museum of Glass and the sculpture department at NYSCC Alfred University USA 2011-2014, where she also taught. Her work has been shown internationally and is included in the collections of KODE Art Museums in Bergen and the National Museum in Oslo. The body is a constantly recurring theme in her art, which consists of both sculpture and installations. She often works with bold and poetic glass sculptures that incorporate both photo and video. She currently lives and works in Bergen where she is an artistic advisor for S12 Open access studio and Gallery, which she established in 2007. S12 has since grown to become an internationally renowned glass art institution. Anne Petters is a multi media artist with a strong background in glass. She received a Diploma in Fine Arts from the Institute for Ceramics and Glass Art, Hoehr-Grenzhausen, Germany and a MFA in Sculpture/ Glass from Alfred University, New York. Born in Dresden in 1978 she grew up in the German Democratic Republic. She understands the political change in her country, which she experienced as a displacement of reality, as a basic influence on her lifestyle and artistic work. Her interest in controlling and displaying moments of our fleeting, vulnerable existence leads her to a poetic, metaphoric use of glass and other materials, including natural phenomena. Anne Petters has been awarded numerous artist residencies, including a fellowship at Wheaton Arts New Jersey in 2012, a residency at the Edinburgh College of Art 2013-2014, the Emerging Artists in Residence at the Pilchuck Glass School, Washington and a visiting scholar residency at the Southern Illinois University. In 2014 Anne Petters received the prestigious Queen Elizabeth Scholarship Trust (QEST) Scholarship for excellence in British Craft, London, GB. She taught as Visiting Lecturer at the Royal College of Art and is currently leading the glass studio at the City and Guilds of London Art School. 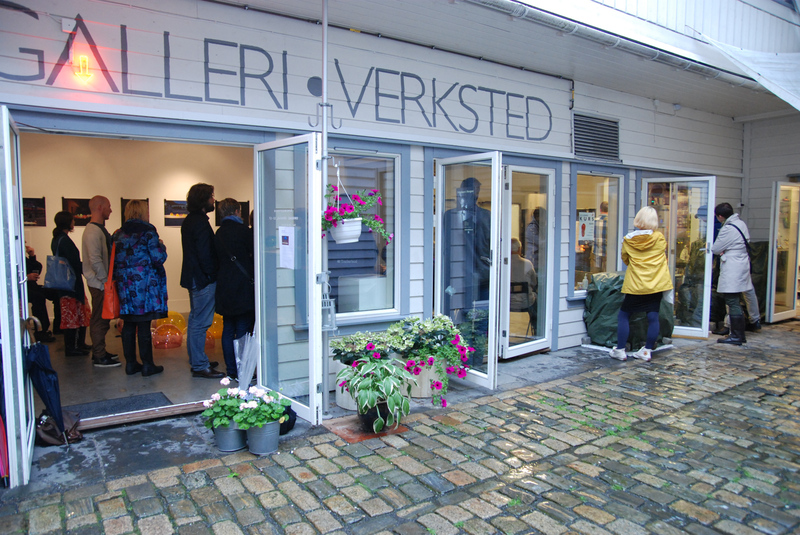 The exhibition is a continuation of a collaboration between visual artist Æsa Björk and musician Tinna Thorsteinsdóttir. By mapping brain activity with EEG recordings, Æsa and Tinna set out to interpret the border between an intangible emotional state and the physical manifestation of brain activity. The EEG recordings were transformed into sound waves. 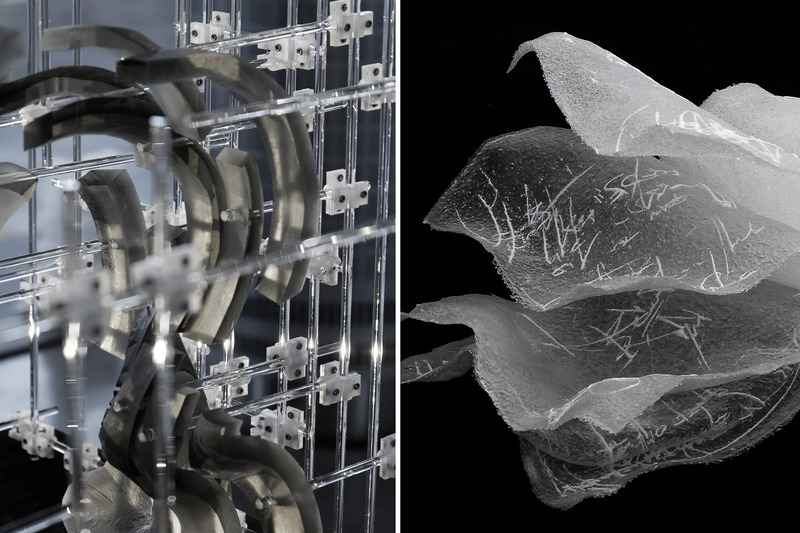 The fragile glass shields serve both as canvases depicting the physical movements that took place, as well as soundboards for brain activity triggered by emotional responses and movement. The sound manifests itself as vibrations created by the conductive speakers attached to the glass. By forming a chamber of human proportions the glass shields can be seen as a membrane separating the self from the outside while reflecting an inner reality which often remains invisible. The first edition of the installation Shield was exhibited for the first time during European Glass Context 2016, at the Bornholm Art Museum in Denmark. Æsa Björk born in Reykjavík, Iceland graduated from the Edinburgh College of Art with a BA (Hons) 1995 and MDes 1997 and in 1994, she studied at VSUP in Prague with Vladímir Kopecky. In 2005 she co-founded S12 Studio and Gallery in Norway (www.s12.no) where she currently serves as artistic advisor. From 2011-2014 she held a 3 year position as a visiting artist and faculty at the School of Art and Design, Sculpture/ Dimensional Studies, NYSCC Alfred University, U.S.A. Her work has been shown internationally and is part of the collections of KODE Art Museums in Bergen and the National Museum in Oslo, Norway. Tinna Thorsteinsdottir born in Reykjavik, Iceland, she studied in Hannover and Münster in Germany before continuing her studies at the New England Conservatory of Music in Boston with Stephen Drury. She has a broad experience with new music and has premiered around 80 piano works especially written for her in recent years. Tinna has performed internationally, both as a soloist and a chamber musician. During recent years she has collaborated with several visual artists including creating interactive sound- and performance works with the glass artist Alli Hoag. Tinna is one of the artistic directors of CYCLE Music and Art Festival in Iceland. S12 Is looking for a Workshop Manager to join its team for a minimum of one year, starting May/June 2018. Established in 2007, S12 is the only centre for exploration, experimentation and dissemination of contemporary glass art in Norway. The main focus of S12’s activities is characterized by artistic quality, exploration and experimentation in its approach to glass. The candidate will be joining a small team of professionals where everyone has the opportunity to initiate new projects and participate in the development of S12. Please spread the word and share this information. Considerations and Ants is showing the work of Justin Ginsberg who has been an artist in resident in S12 this summer. The exhibition presents a comforting and discomforting domestic-like environment, in which objects, drawings, videos, and installations reflect the instabilities and insecurities of our existence. Ginsberg questions the way we humans act, while taking a closer look at our desire and need to control our lives and our surroundings. While the home operates as a place of protection and comfortability, it becomes a place in which we enslave ourselves through the effort to obtain, maintain, and care for it – through hard work, sacrifice, upkeep, cleaning, and decorating. Ginsberg sees the home as a type of trap in which we contain ourselves, our belongings, and our lives. You own the house and the house owns you. Ginsberg challenges the perceived boundaries of material and the presumed nature of things, relying on metaphor and gesture to express his interest into the systems and structures we use for understanding the world around us – bringing context to the unknown and chaotic. He pushes both material and idea to extremes, constantly attempting to challenge the definitions that categorize the world. Often, through the accumulation of the smaller individual parts, his work utilizes materiality, to investigate the relationship between parts to a whole. He is interested in this collective gesture, achieved through tedious constructions, exploiting the aesthetic qualities of the material. Born and raised in Dallas, Texas, Justin Ginsberg spent eight years traveling the country, learning from practicing artists before returning to his home city. He began working for the Art and Art History Department at the University of Texas of Arlington in 2009, while pursuing his Masters in Fine Art Degree there. Today he is the head of the glass area and an Assistant Professor of Practice at the same University, while also pursuing his own creative practice and research. Ginsberg shows his work nationally and internationally, and he has been included into New Glass Review five out of the last six years. His work has been bought by institutions such as Kunstpalast Museum in Düsseldorf, Tacoma Museum of Glass, and The Museum of American Glass. S12 Open Access Studio and Gallery celebrated its 10th anniversary with the opening of the exhibition RAGING DREAMS over the horizon by the French artist Baptiste Debombourg. Debombourg has received international acclaim for his monumental installations. Waves of broken glass breaking into and flooding rooms and structures, taking over and transforming buildings and areas. The work can be experienced as both threatening and beautiful as the artist both destroys and rebuilds. The broken and reconstructed material conveys many stories and is often interpreted as a critique of the world we live in – of consumerism or a world in the process of falling apart. Baptiste Debombourg is an innovative artist who pushes boundaries, explores various media and collaborates with artists from other fields, be it artists, architects or fashion designers. He lives and works in Paris. Debombourg has studied sculpture at Ecole Nationale des Beaux-Arts in Lyon and did his post-graduate work at Ecole Nationale Supérieure des Beaux-Arts in Paris. In France he is one of the most outstanding artists of his generation with numerous public presentations at home and abroad to his merit. He has built installations in cities such as Paris, Strasbourgh, Miami, Québec and Sarajevo, and will in May ´17 present a new public installation in Le Havre on the occasion of the city’s 500th anniversary. 31.03.17- 07.05.17 – Vernissage Friday 31st of March at 7 pm. Welcome to the opening of the exhibition “Battle Cry” by Emma Woffenden – one of Britain’s leading and most innovative glass artists. With her unconventional approach to the material she has paved the way for a generation of artists working in conceptual glass. This is the first time Woffenden is showing her work in Norway. Using a wide range of complex glass and mixed media techniques Woffenden investigates the more intangible conditions of existence such as sensations, feelings and awareness. Her sculptures are partly abstract and at times surreal. Figures put together by different parts and materials almost remind us of a mixture between human, animal and machine. By implying incidents that have just happened or are about to unfold she opens up for questions and creates an unnerving atmosphere in her installations. Woffenden are giving an artist talk Saturday 1st of April at 2 pm.